In Texas, folks have strong opinions on their chiles rellenos; preferably the cheese stuffed peppers are fried and served with some sort of tomato sauce. The chile of choice here drifts from the meaty, mildly hot poblano―to the local hatch pepper, which has a very short season. In prepping the peppers, a quick roasting is the fastest way to remove the tough outer skin. I like to the put them directly on the stove burner of my gas range over a hot flame and turn them until evenly charred. Then they are dropped into a paper or plastic bag for a few minutes to steam sweat the skins right off of them. Searing whole chilies under the broiler works well, too. If I leave the stems on, a slit in the side of the pepper is usually enough to aid in removing the hot interior seeds. But what about that oily-greasiness from the frying factor? I have spent considerable time playing with these guys, trying to come up with an acceptable compromise. I prefer my chiles coated in a light fluffy batter and oozing with plenty of cheese when you cut into them. Isn’t that is enough fat? I don’t need any more. One obvious solution is to bake the chiles in the eggy batter―quite tasty if the accompanying sauce is well executed, too. Still, you end up with more of a chile-cheese soufflé and miss the luscious sealed in flavor that the hot oil bath provides. After considerable tinkering I still wasn’t satisfied. 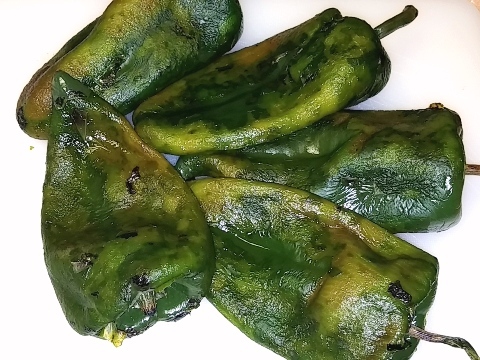 Finally, I buckled and revisited my old stained and worn chiles rellenos recipe and took another look at it… I still liked it as much as anything I had considered. The sauce could use a little updating, but perhaps re-inventing the wheel wasn’t necessary after all. Turns out it was more a matter of adjusting the type of pan and cutting way back on the amount of oil. I learned it is possible to have “fried” rellenos by using a good non-stick pan and a modicum of vegetable oil. Instead of floating the chiles in a hot oil bath, a light coating in the bottom of the pan is enough to brown both sides quite nicely. Results: clean, elegant, and very satisfying. Melting cheese-packed roasted chiles adhere to a fluffy crisp batter, thanks to a light dusting of flour. A fresh chile-spiked sauce provides just the right touch; it elevates the rellenos and makes them sparkle. 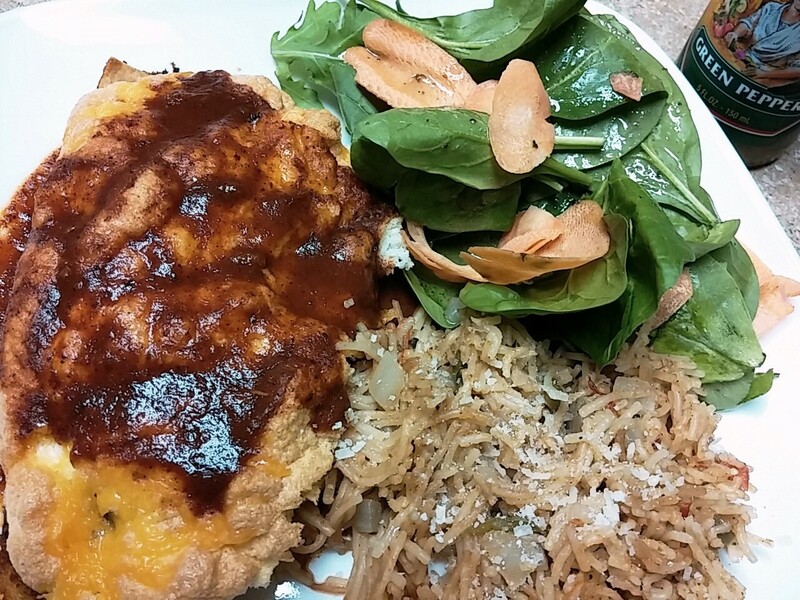 Of course, there is always Plan B: the fall-back baked chiles rellenos version. To char the peppers: Over an open flame or under a broiler char the peppers until blistered on all sides; place in a tightly closed plastic or paper bag to sweat for 15 to 20 minutes. Rub the charred skin from the peppers. Make a slit in each and carefully remove the seeds; pat dry. The stems can be left intact. This can be done ahead. To prepare Rojo Sauce: In blender or food processor, place the onion, garlic and tomatoes and puree. Heat sauce pan over medium heat with 2 tsp oil, add the oregano or cumin (or both), the chile powder and heat the spices until aromatic. Carefully pour in the blended tomatoes and simmer briefly to soften flavors, about 10 minutes; season to taste with salt and pepper. This can be done ahead. Fill the peppers with cheese and set aside. To make batter: In small bowl, whisk the yolks with fork until well beaten, about 1 minute. Stir in 1 tbsp milk to dilute, then stir in 2 Tbsp flour until smooth; add the final 1 tbsp milk stirring until thick and smooth. Place the 3 egg whites in mixing bowl. With mixer, beat until foamy then add the ½ tsp salt and continue beating until whites begin to form peaks. Spoon a cup or less of the whites into the bowl of yolks and gently fold in with spatula to lighten the yolks. Fold the yolk mixture back into the remaining beaten whites, folding gently to form a light batter. Preheat oven to 375 degrees. Lightly spray a baking dish with oil. To prepare the chiles rellenos: Place the ½ cup flour in a wide bowl. Over medium/high, heat a non-stick skillet and drizzle lightly with oil to coat bottom of pan. 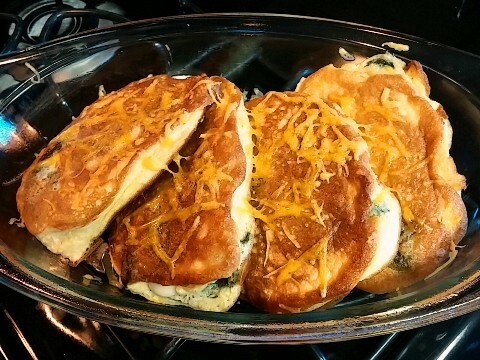 Baked Rellenos: preheat oven to 375 degrees. 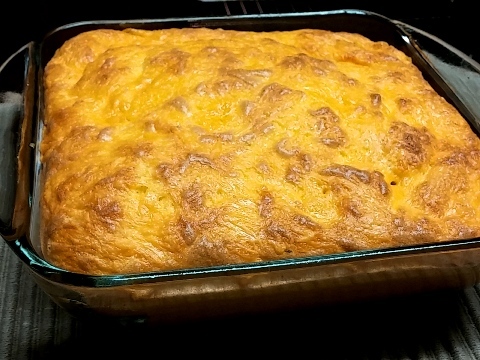 Coat a large soufflé dish or 2-quart baking dish with cooking spray. Prepare the chiles and the batter and spoon about 1/3 of the batter onto the bottom of the baking dish. 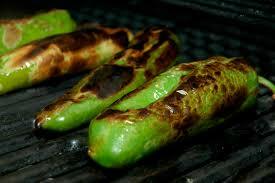 Dust the stuffed chiles with flour, tuck them on top and cover with the remaining batter. Sprinkle with 1 cup grated cheddar cheese. Place in preheated oven and reduce temperature to 350 degrees. Bake for 25 to 30 minutes until puffed and nicely browned. Serve with Rojo Sauce.